Home DIY Projects	French Country Kitchen Update! Happy Hump Day, friends! Today I thought I’d share a peek into the kitchen in our new house. We are still busy making it our own, but it’s coming along nicely! 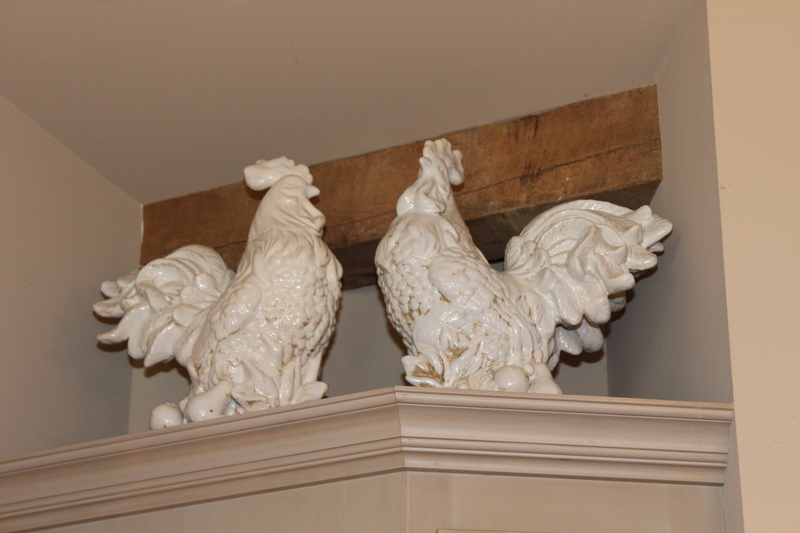 Come see our French Country Kitchen Update! We moved into our new home last June. Since then, we’ve been busy trying to put our spin on a French Country style home, when our former homes were more traditional. However, most of our old furniture fit seamlessly into the decor, leading me to believe I’ve always harbored a French Country vibe, but didn’t put a name on it until recently! This is how our kitchen looked when we moved in. The floor plan is very open, which again is different from our previous homes. I lived with the existing light fixtures for a few months. They are very pretty and unlike any pendants I’ve ever seen. But, they just didn’t have the sparkle that I love. Plus, I had two crystal chandeliers in my stash waiting in the wings for this very spot! So, you can imagine my joy when my electrician friend installed these beauties over the kitchen island!! Since there was a hole in the middle where the third pendant hung, I covered it up with a decorative medallion and painted it to match the ceiling. If there’s anything better than one crystal chandelier, it’s two! Can I get an amen? The hood over the gas range is very large. So, I painted it a lighter color to brighten up the kitchen a bit. As it turned out, it didn’t make a huge difference, but the fact it’s lighter makes me feel better. I love the beautiful beams. They, too, were here when we bought the house. Kudos to the previous owners for their good taste, and high-end touches, such as the reclaimed hardwood floors and beams. And this is where we are today! We use the kitchen island all of the time. It’s true when company comes, everyone congregates in the kitchen, so we have three bar chairs and a few small stools we keep in the kitchen. My husband and I enjoy cooking so this gas range gets used every single day. So, this is the entire kitchen and dining area. Notice there is no refrigerator in the kitchen? Well, it’s located in the next room over, which is the Butler’s Pantry. We thought it would drive us crazy not to have a fridge in the kitchen, but we are sort of accustomed to it now. Plus, we joke we can use the exercise. I must say, most refrigerators are not that attractive anyway, and because our floor plan is so open, I’m happy not to see one from the Great Room or dining area. Something else you may notice, is a lack of overhead cabinetry. Again, we thought this might be a problem. Where would we put our dishes and glassware? It turns out all of the lower cabinets have sturdy pull out drawers which easily stores all of our plates, dishes and cook ware. This gigantic, beautiful mirror was here when we bought the house and we purchased it from the previous owners. How could we not? The mirror dwarfs an 82 pound dog! So, this angled wall faces the Great Room and is right beside the kitchen. It reflects the living area and some of the Terrace. Underneath the bar is plenty of storage, plus a beverage refrigerator. We keep chilled wine, mixers and our coffee creamer in here for easy access.